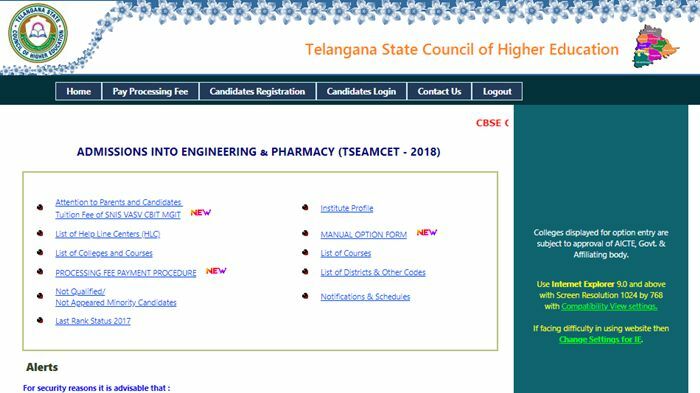 TS EAMCET Web Counselling Procedure 2018: Students who have come across the Telangana EAMCET examination 2018 and got the rank in the examination must aware of the TS EAMCET web counseling process. Students have to have the clear vision of web-counseling process, form filling, and other details. For the candidates who just have finished with the document verification round, the complete TS EAMCET web counseling process and Online Web Options Entry was explained here. Initially, students need to fill the TS EAMCET Option entry form, which is accessible on TS EAMCET official website, tseamcet.nic.in. In the optional entry form, students can select their choices such as district code, course code and college code details. Candidates applying for Telangana EAMCET web counseling can check the complete guidelines from the following. Initially, candidates need to visit the TS EAMCET official portal, tseamcet.nic.in. Click on Candidates Registration Form will be appearing on the homepage. Now, provide your ROC Form No (Form which is given to you at certificate verification center after verification is completed), EAMCET Rank, Hall Ticket No, and Date of Birth Details in the form. Now click on “Generate” Button below and set a password. The password must be 8 characters. In which one numeric is mandatory. Create the password as you prefer. For example, aabbcc11, abab1234, abc12abc etc. Now, enter your/parents Mobile No., E-mail Id. (Optional) to get the alerts from the authority. Click on ‘Save Password ‘button to save your Password. Input Boxes with the * mark is mandatory. After registration and creating the password, students can now log in with the Login form. The Login Form prompts to enter the details such as Login ID (That is received by your Registered Mobile Number), Hall Ticket Number, Password, Date of Birth etc. Enter all the required data and click on “Sign In” Button. The OTP (one-time password) will be sent to the applicant’s mobile for the verification purpose. Enter the received OTP at the checkbox. After successful entry of OTP, candidates will get permitted for web counseling. The list of districts in the university region will be displayed on the screen. Students can select the multiple numbers of districts and colleges. The colleges listed in preferred districts will only be visible for the candidates. Now, various courses will be listed such as 3-year Engineering and Non-engineering courses; and 31/2-year Engineering courses will be displayed on the lower table. Students can select their preferable courses among them. Once check the Polytechnic and Course Codes before entering the Options. Students can tap on the college code to get its name and other details. Now, mention the Option Numbers against Polytechnic and Course Codes; as per the preference on the specimen option form given to you. On the Option Entry Form provide the desired option numbers in the input boxes. For example: If your first Option is for CCP, then enter in the Input Box as 1 and if CIV is your second option enter 2, and MEC is the Third option enter 3 in the Input Box provided. Candidates can also change their option by tapping the delete button on the keyboard and enter the desired number. To delete an option, delete the option number in the Input Box. Now, the options can be saved eventually. If students wish to select the Polytechnic course in any district, they can select the district name and select the course from the list of courses displayed over there. The input box will be displayed only if that particular course is available. After selecting, take a printout of the options. The students can finally view, save options by entering the hall ticket number. Students can finally, log out if they are sure about the selected options. In second counseling college can i join in first counseling college is this possible. Sir after selection of colleges it is doesnot saving, it is showing 'process may take some time click on ok to continue' l logineed for 3-4times but it is saying same.what I have to do ? Firstly we are saved 17 options and logout again login and choose 50 options again not saved wt problem this ??? same problem. Is the problem solved?? ?Please tell us how to solve this. Can i change the options i entered ? How can I change options, what is the last date?